I had no idea this book was a Labyrinth re-telling, which was perfectly fine because I’ve never actually seen the movie (Blasphemous, I know). Therefore, I can’t compare the book to the movie. I went into Wintersong blind, and what a treat it was. Not knowing what I was getting myself into provided the foundation for a wondrous experience. Now, from what I’ve seen, people who have seen and love the movie also adore the book for the most part – so it’s been a win win. Lisel’s war of wits and passion with the Goblin King is a seductive one indeed. The book reads like two separate novels: the beginning in the human realm and the life after her sacrifice. It’s mind boggling. The whole atmosphere shifts with the plot and it is mesmerizing. The writing is dark and frightening yet utterly consuming. It draws you in and drowns you in wild abandon and magic and the force of nature that is the Goblin King. The narrative is raw, unflinching, and honest. Characters are flawed, they unravel and pull themselves back together through their sheer force of will and the barest hints of a thread. The romance is a paradox of opposites yet perfectly balanced. Every detail plays a role, every detail has a purpose and a deeper meaning. Brilliant, simply brilliant. Wintersong is a jewel with millions of sparkling facets. It is sensational, intoxicating, and thrillingly innovative. 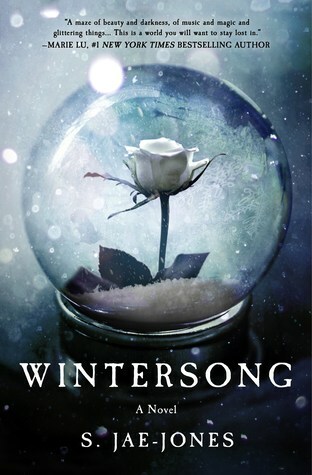 Wintersong is the kind of novel you can lose yourself in over and over again – like playing your favorite song on repeat only it never grows old. If you only read one book this new year, make it this one. Her grandmother had told her to beware the wolves that prowled in the wood, but the little girl knew the little boy was not dangerous, even if he was the king of the goblins. Will you marry me, Elisabeth? the Goblin King asked. But the little girl did not reply.